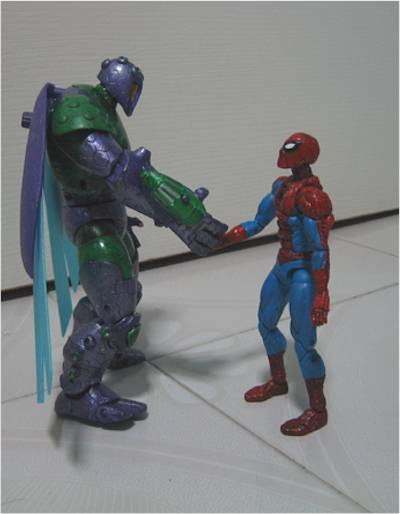 SpideyWeb writes in with another great guest review tonight, this time of the brand spankin' new Beetle in the Spider-man line - take it away, SW! Abner Jenkins was a skilled factory mechanic. However, he had other plans, constructing a sticky-fingered battle suit with flight capabilities in order to become a master thief. Early run-ins with Spider-Man and Daredevil convinced him that he needed power as well, resulting in a sleeker battle suit with more offensive capabilities and greater strength. As with the previous Spider-Man waves, this is the regular red-carded packaging. Not much excitement here. And there are a few twist ties in here that you got to untie, so that drops some points here. First impression, this guy is huge! I really do not understand why he is so big. Abner Jenkins is only 5” 11’, even with his battle suit I do not think he became so bulky. I’ll be objective on the sculpting here, judging it solely on the sculpting and not whether it is comic-accurate. Sculpt is very good, you can see some fine details on the forearms, biceps, legs and even the helmet. The addition of the wings to the sculpt makes the figure very majestic. The wings are meant for the action feature (see below section) but it adds a lot to the sculpting which is very welcomed! Paint is not consistent over different figures. On the 2 that I saw, one has a silver wash and the other has not. Also, you may also want to check that there are no silver blotches on your figure which is most likely due to the silver wash. The thumbs are painted gold and on mine, the gold paint seemed to be covering up to the first digit of the thumb. Clearly it is a paint slip. 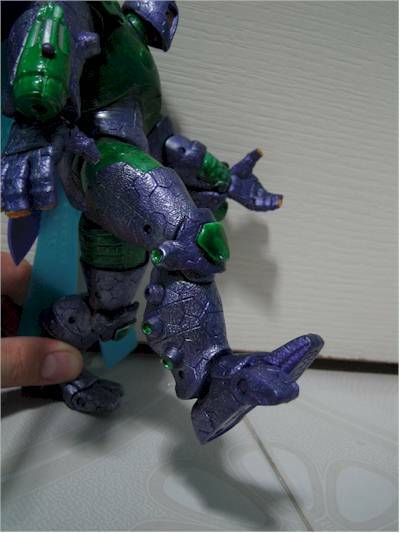 The rest of the figure is pretty alright with no major paint slips between the purple and green boundaries. 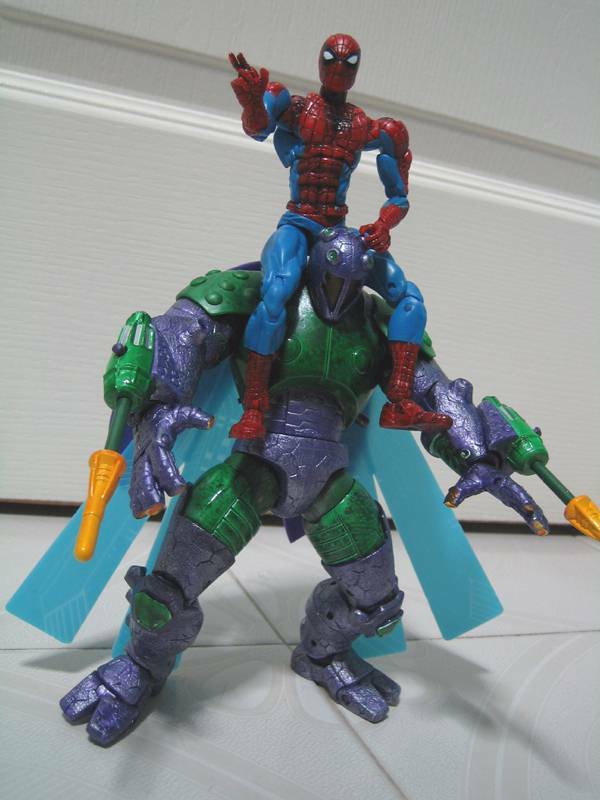 This is considered an achievement by Toy Biz’s standard. I gave this a perfect score. This figure loses out on the lack of mid torso bend (due to action feature), double jointed elbows and the mid calves twists but I have little to complain at all. 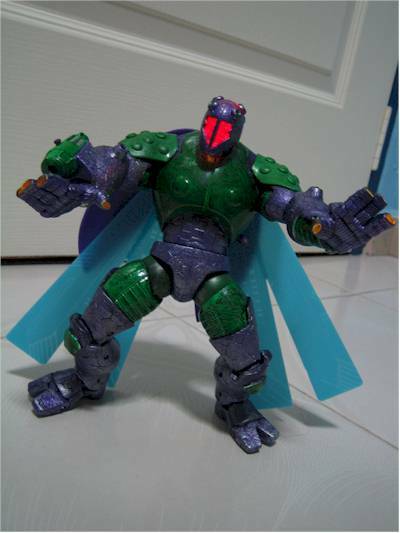 And since I am an articulation freak, it says a lot. And why is that so? Because this figure comes with 3 articulated fingers on each hands and 2 articulated toes on each feet! 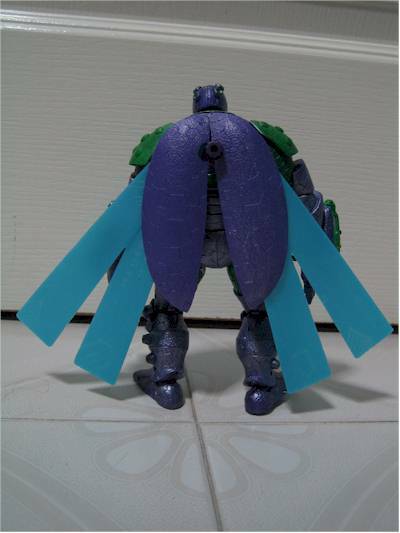 The 2 rubber shoulder pads do not restrict the movement of the arms too much so is not too much of a problem for me. 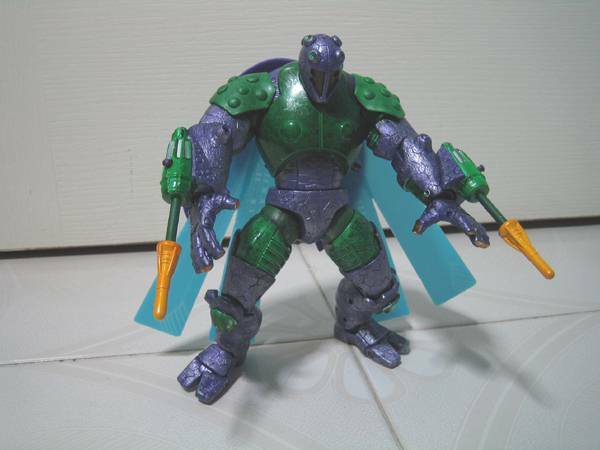 Besides this, the standard articulation is there. The head can look up and down despite having the light up feature. 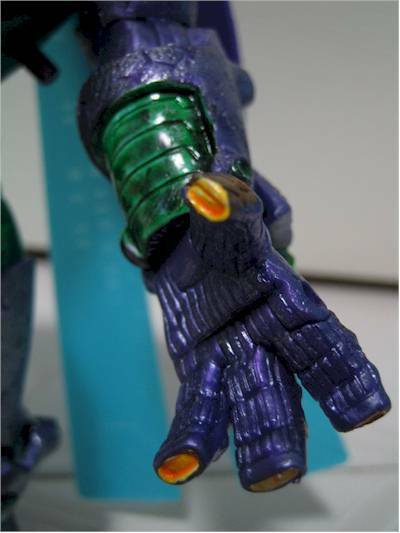 The wrist twist is also preserved despite having missiles launcher at the wrist area. All in all I am very happy with the articulation of this figure. 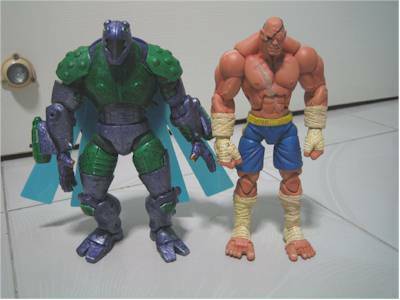 The figure is fairly stable and Toy Biz should keep up the good work! All the joints for mine are tight but not too tight. They are all functional and very well done. No complaints whatsoever here. Included in the package are the fluttering wings (1 set outer, 1 set inner) and 2 firing missiles. Not a lot by my standards. 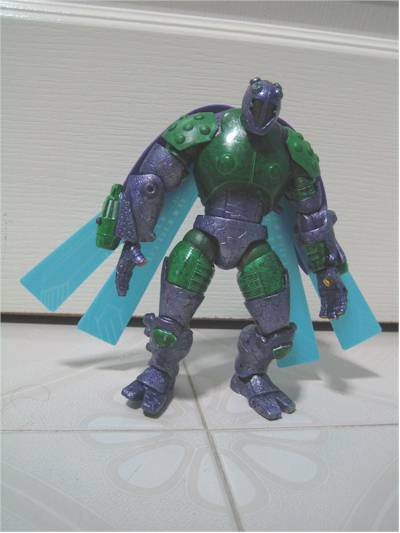 But if you take into account the size of this figure, the lack of accessories should not come as a surprise. The wings, however, made the figure look much better (see sculpt section). 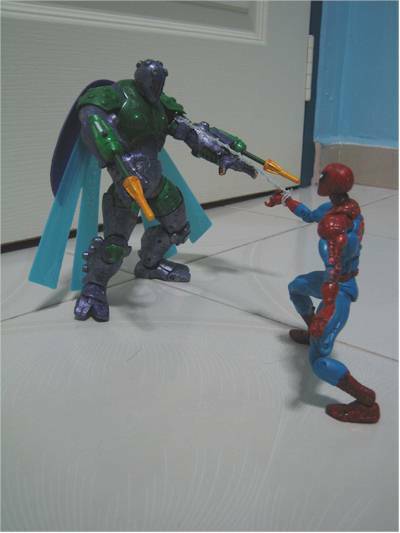 There are a couple of action feature in this figure. The simplest one is the firing missiles from the forearm launchers on both the arms. The light up feature caused the body to lose the mid torso bend which can be very useful for balancing. The other feature is the interesting one. You fixed up the wings, and wound up a knob on the back and when you press the button under his right armpit, the wings will flutter and the face will light up (note that you have to turn the switch to “ON” located at below the left armpit, which I did not do initially and I thought the batteries were flat and went through a lot of hassle of finding screwdrivers and batteries). The light up face is nice. 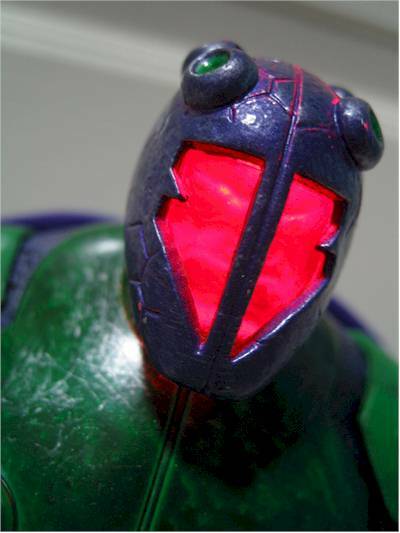 There is a translucent face located below the mask and when light (red color) is turned on, you can see the details of the face. This alone gave this section 1.5 point. The fluttering wings do not work well. If you wind the wings and do not press the button until fluttering of the wings ceased, the batteries will run flat. The missiles launchers are also not that attractive to me. If you like these kind of stuff or are intending to give one to a kid, you might want to add half a point here. At S$12.90 (approx US$7.80), I think it is still a good deal. This is one villain that I suspect will not see plastic for some time to come so it is cool to have (despite being not exactly comic accurate). If you have to get it at a much higher price than this, then I would probably drop off 2 stars. Given the rarity of this figure (probably 1 per pack), it should be hot for collectors. I will pick it up anytime as you can see that this figure has fantastic articulation and good sculpt although the fluttering wings action feature can be better. 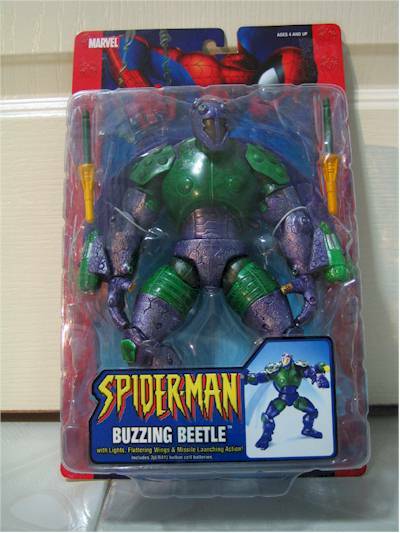 It also won't come to me as a surprise if this is the only Beetle we are ever going to see in plastic, so, if you do see this guy hanging on pegs at retail, do pick him up! 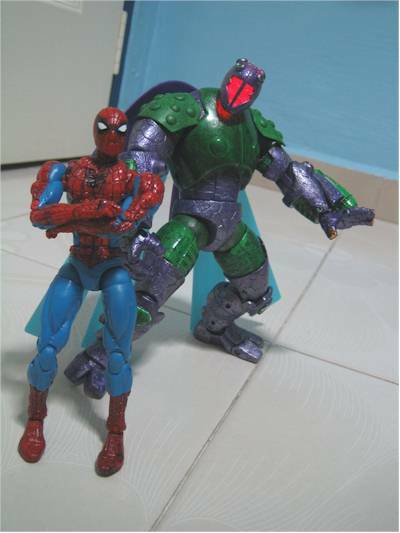 Figure from the collection of SpideyWeb.